The Scripture says that the 'woman was surprised'..
How often do we feel that Jesus is too far away that he's too busy or that we've done too much wrong for Him to stay close to us... We deem ourselves to be unworthy of His love...we need to be reminded that as believers we are filled with the Holy Spirit and God will never leave us or forsake us ...ever! She asked him why...His reply was quite remarkable, "If you only knew the gift God has for you and who you are speaking to, you would ask me and I would give you living water.."
Jesus wants to give us everything.. He wants to give us the world..his love for us is unconditional.. It's pure .. He wants us to be filled with His living water ..He wants to bless us beyond our imaginations.. The Bible goes on to tell us about this woman, she had quite a past.. Jesus spoke to her and told her that she had been married five times and was presently living in sin with a man to whom she was not married..
Our hearts.... Give our whole hearts to Him.. He asks for our burdens to be cast upon Him..
Jesus was saying give it all to me ...give me your heart.. give me your old ways, give me your burdens, your sins, I will take them away ..you will never have to return to them again..
become that new creation in Christ being filled to the overflow with the living waters of Jesus ...again when we are filled with His Water, letting it cleanse us to be made new and whole in Him...then there is no longer room for anything else..
Jesus was using her to glorify Him..she was quite impactful.. The people of the town believed her and followed her no matter who she had been or how imperfect she was..
God is the fountain of life...He can bring that living water that quenches our thirst forever.. we can stop looking to the world, we can stop searching for the next latest and greatest ..the things that we feel will fix the holes in our hearts.. let the water, the living water of Jesus Christ fill you to the overflow! He is the Messiah.. 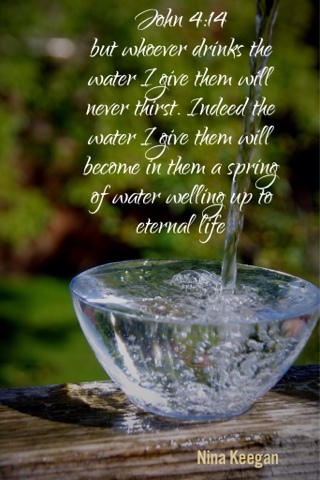 He is calling you to Him ..don't believe the voice of the enemy saying you've done too much wrong to ever be saved, your sins are too grand..
God doesn't waste a thing and what the enemy has meant for harm in your life will only cause your promotion.. drink deeply from His living water today.